Adhesive allows durable tabs to be repositioned when applied but become permanent over time for security. Handwrite or use your laser or inkjet printer to print on front and back of tabs. Easy to format with templates in Microsoft® Word. Use with personal organizers, bound reports, reference manuals and more. This is one sticky situation you'll appreciate. 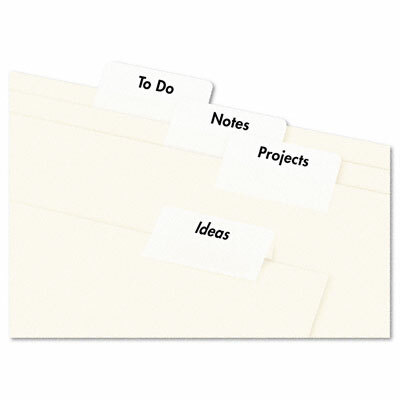 With these tabs, you can organize bound reports, reference manuals, personal organizers and more quickly and easily. Self-adhesive tabs are repositionable when applied, allowing you to find just the right spot. Over time, the adhesive becomes permanent, proving these tabs will stick by you. Easy to print or write directly on the tab. Easy to use with free Avery® templates and software.